Kevin Ghiglione is inspired by the presence of mankind through time - evidences of wear, vestiges of life, and hints of lost knowledge. Recent work includes references to contemporary science and invention being denied, obfuscated and hidden. Intimately, the artwork is a discovery of the surface that asks the viewer to question what information has been lost. His smaller works are predominantly created in mixed media acrylic. 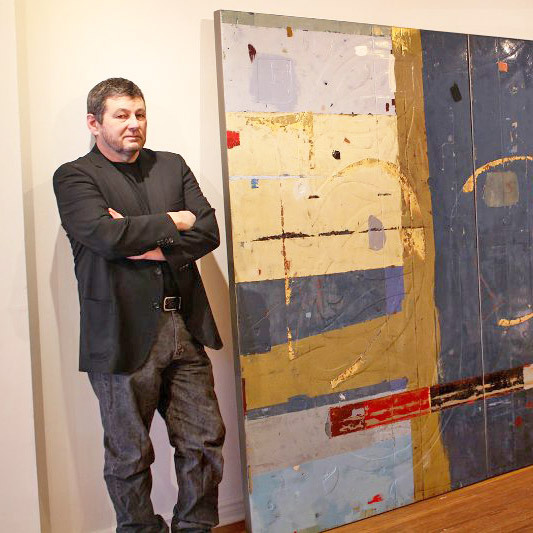 His large paintings are created with many layers of mixed media encaustic medium manipulated by hiding and excavating elements. Kevin Ghiglione’s paintings are abstract with many layers of composition. He works in the ancient encaustic medium and various mixed mediums. He is fundamentally inspired by the mark of mankind through time. His artworks often reflect evidences of wear, vestiges of architecture, and hints of communication through the passage of time. His artwork, a discovery of hidden and excavated elements, suggests a missing part of history when viewed in person. Kevin has had several successful solo shows at Muse Gallery in Toronto and has participated in various group exhibitions. He is represented in Toronto by Muse Gallery and in Calgary by Gibson Fine Art. His work is in collections across North America and Europe. A native of Saskatchewan, he attended the Alberta College of Art and Ontario College of Art where he studied print making, experimental media, photography, communication arts and industrial design. His working career has led him into various fields of art related careers. 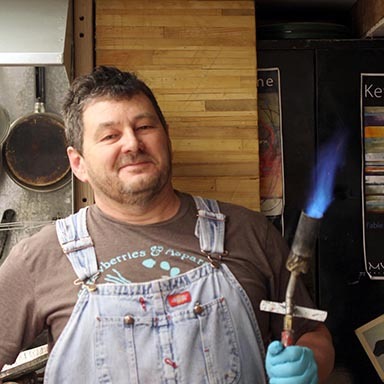 Kevin brings four decades of artist experiences to his encaustic painting process. Kevin resides in Toronto, is married with three children and creates artwork full time. The ancient art of encaustic painting involves the quick application of molten beeswax and damar (tree) resin to a hard painting surface. Oil and powder pigments add colour to the natural translucent wax. The word ‘encaustic’ means ‘created by fire’ or ‘to burn in’. Each layer of opaque and translucent pigmented wax are then fused with a torch or heat gun to ensure a bond to the wax layers underneath. Thick coloured layers create a lush sensuality, while thinner translucent layers create mysterious depths. Ghiglione often claws or scrapes away wax from his encaustic paintings to expose past workings of surfaces and achieve textural and visual depth. The heavily worked painting surface transforms into a low relief sculpture. The encaustic medium can be lightly buffed to bring up a deep lustre. Encaustic – – Literally means “created by fire”. Dating back to the 5th century B.C, encaustic paintings are created by melting together natural beeswax and damar (tree) resin. Colour is added by powder and oil pigments. Applied quickly to a firm surface, the molten wax can be applied as thick, lush sculptural colour and combined with other materials. A rich or heat source then fuses the new wax layer to the previous wax layer. The surface can also be scraped and excavated to reveal past layers. Encaustic is a natural medium and speaks directly to your senses. The surface is exotic to the touch. The aroma of honey and beeswax plays to your sense of smell. Transporting – Handle the painting only when it is cool to the touch. Protect the edges and corners. Plastic wrap is the best material to cover the surface. Do not use fibrous material such as wool, paper, or bubble wrap to cover the surface. Handle the painting by the outside frame, the back hanging wire, and the back supports when moving or hanging. Avoid extreme temperature shock when moving from indoors to outdoors. Hanging - Handle the painting only when it is cool to the touch. The painting can be placed anywhere any living plant, animal or people habituate. Avoid extreme or focused heat sources. Avoid fingers and objects touching the surface of the painting when it is hot. Once positioned, the painting will be trouble free and withstand normal heat and cold suitable for any living thing. Lighting – Lighting and placement can result in dramatic viewing results. The encaustic medium benefits from proper lighting conditions. Focused lights reveal the depth of the layers of the semi-translucent wax. Indirect natural light from a window often brings out the painting’s quiet sculptural qualities. Halogen lighting can be used providing the bulb is not in intimate contact with the painting’s surface. Polishing – Beeswax is a natural material, so the painting will ‘breathe’ for some time after it has been created. Handle the painting only when it is cool to the touch. A deep lustrous glow can be re-instated to the surface by gently ‘buffing’ or ‘polishing’ the surface by hand. It is okay to touch the painting! Use a soft cotton cloth, turning it repeatedly while buffing. As the painting ages, the painting’s lustre will remain for long periods. Cleaning – This can easily be done in the event the painting needs to be cleaned due to dust, splashes and so on. Handle the painting only when it is cool. Use only cool water. If needed use a drop of dish soap. Rinse the solution with clean, cool water. Buff as necessary.